It is the single best, most up-to-date collection of info on the link between media violence and violent crime that I have seen so far. It is THE reference source for people who are looking for info in this area. The Blue Corn Comics site is devoted to analyzing America's racist and violent culture, especially as portrayed in the popular media. Rob Schmidt, the site's keeper, publishes multicultural comic books, writes a newsletter on media stereotyping, and disseminates information to his own list of contacts. Among his site's 600-plus pages are several dozen postings dealing with violence in comics, TV, movies, video games, music...even Greek plays and the Bible. "I'm glad to receive the seal of approval from such a renowned expert," says Schmidt. "One of Dave's articles helped shape my views on the media violence question. It's critical that we keep getting the word out: that the link between media violence and cultural violence is real and proven." Grossman's endorsement is especially valuable because of his wide range of experience on violence-related issues. A retired Army officer, he authored the Pulitzer-nominated book On Killing: The Psychological Cost of Learning to Kill in War and Society and lectures and consults frequently on America's cult(ure) of violence. 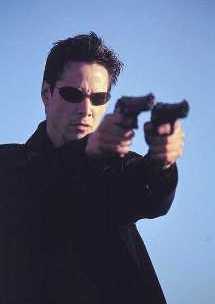 His Killology Research Group educates people about the causes and effects of violent behavior. Rob, you are the bomb. [After] researching further, I cannot find anybody who even holds a candle to you at bluecorncomics.com....Hate to get too gushy here but your work is excellent. Richter knows Native stereotyping because his own site highlights racism against Indians—especially that of sports teams such as the Washington Redskins and Atlanta Braves. When he first visited BlueCornComics.com, he claimed it was one of the top 5 sites on Indian stereotyping. After seriously checking out the competition, he declared it no. 1. Among the site's noteworthy features are a Native American Stereotype of the Month contest...postings on classic stereotypes (Indians as warriors, savages, and mystics)...and individual writeups on recent stereotypes such as the Pocahontas and The Road to El Dorado movies. Publisher Schmidt added his 600th page this summer and should reach 1,000 sometime in 2002. Schmidt focuses on Native American culture and history because of what they tell us about America's values. "I go by what Felix Cohen, the modern founder of federal Indian law, said when he called Indians the miner's canary," says Schmidt. "As Cohen noted, 'Our treatment of Indians, even more than our treatment of other minorities, marks the rise and fall of our democratic faith.'" "America is John Wayne country," Schmidt adds. "We shoot first and ask questions later. There's no better way to understand our culture than to study its cowboys and Indians." "That's the link between everything I do," he concludes. 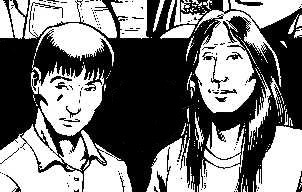 "It's why I publish PEACE PARTY, my multicultural comic book featuring Native Americans. It's why I run a stereotype contest, comment on racism and violence in the media, and gather information documenting our cultural mindset."